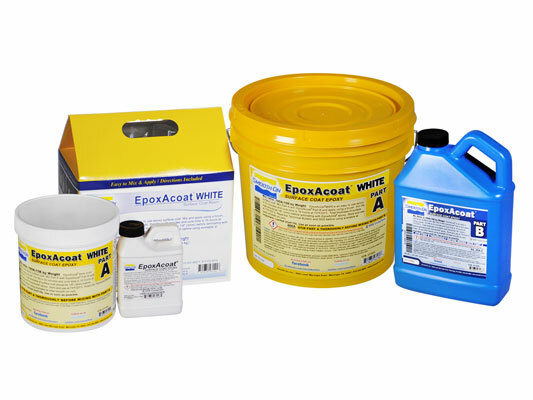 EpoxAcoat™ WHITE Product Information | Smooth-On, Inc. Specific Volume 18.5 cu. in./lb. Shrinkage 0.00015 in. / in. EpoxAcoat™ RED, EpoxAcoat™ GREY and EpoxAcoat™ WHITE are thixotropic epoxy gel coats which are widely used for hand laminating and tooling applications. They are tough and strong surface coat resins which cure at room temperature and offer exceptional abrasion resistance. For high temperature applications (to 284°F / 140°C) use EpoxAcoat HT™ (see separate technical bulletin). EpoxAcoat™ RED, EpoxAcoat™ GREY and EpoxAcoat™ WHITE are easy to use, wet out well over a variety of surfaces and will coat vertical surfaces without sagging. After the epoxy becomes “tacky-hard” at room temperature, fiberglass cloth is laminated behind the surface coat using Free Form™ AIR putty or EpoxAmite™ Laminating Epoxy to produce strong, lightweight tools that have excellent dimensional stability and surface finish. Cured surface machines precisely without chipping. Applications include precision tooling, master and pattern making, core boxes and fixtures. Materials should be stored and used in a room temperature environment (73°F/23°C). Elevated temperatures will reduce Pot Life. EpoxAcoat™ RED Resin and PART B Hardener must be properly measured and thoroughly mixed to achieve full, high-strength, solidcure properties. Because no two applications are quite the same, a small test application to determine suitability for your project is recommended if performance of this material is in question. Measuring / Dispensing – Accurate ratio measurements by volume or weight are required for the material to cure properly and develop full physical properties. Dispense Parts A and B proper proportions into clean plastic, metal or wax-free paper containers. Adding Color - The EpoxAcoat™ Epoxy Surface Coat System can be colored with UVO™ color tints (from Smooth-On). Pre-mix tint with Part A thoroughly and then add Part B.
Mixing – Be sure mixing utensils are clean and free of any potential contaminants such as dirt, dust or grease. Mix Parts A and B thoroughly for at least 3 minutes with a square edged mixing stick. Be aggressive and scrape sides and bottom of mixing container several times. Use the square edge of mixing stick to bring material off of the sides of container and blend. If using a drill mixer, follow with hand mixing as directed above to ensure thorough mixing. NOTE: Pot life can be extended by pouring mixture into a shallow pan, reducing its mass. Important - Mixed EpoxAcoat™ Resin with EpoxAcoat™ PART B Hardener is exothermic, meaning it generates heat. A concentrated mass of mixed epoxy in a confined area such as a mixing container can generate enough heat to melt a plastic cup, burn skin or ignite combustible materials if left to stand for its full Pot Life. Do not use foam or glass mixing containers or apply sections thicker than 1/8” (0.32 cm). If a batch of mixed epoxy begins to exotherm, move it to an open air environment. Applying – You will apply two thin layers of EpoxAcoat™ using a disposable chip brush. After epoxy is mixed, you must work quickly so that the mass in your mixing container does not set up prematurely. NOTE: Pot life can be extended by pouring mixture into a shallow pan, reducing its mass. After applying 1 thin layer of epoxy, let partially cure for 1 hour until “tacky hard”. Apply a second thin layer and again partially cure for 1 hour until “tacky hard”. Next, Free Form™ AIR Epoxy Putty or EpoxAmite™ 100 Laminating Resin and reinforcement cloth may be laminated over the surface coat. See EpoxAmite™ 100 Laminating Resin Technical Bulletin for details. Cure Time: Refer to specified Cure Times in Handling Properties at 73°F / 23°C depending on mass. Cured material will be hard and unable to penetrate with a finger nail. Cured epoxy can now be dry sanded. If machining or sanding, wear NIOSH approved mask to prevent inhalation of particles. Painting – Cured EpoxAcoat™ can be painted and / or primed and then painted with acrylic enamel paints. Let paint fully dry before putting part into service. Removing Epoxy – Uncured / Non-curing epoxy: Scrape as much material as possible from the surface using a scraper. Clean the residue with E-POXEE KLEENER™ available from Smooth-On, lacquer thinner, acetone or alcohol. Follow safety warnings pertaining to solvents and provide adequate ventilation.